Here is the rear part of the new McLaren Speedtail. The design seems quite different from what we know on the other models. The new “hyper GT” McLaren, the successor of the P1 and the heir of the legendary F1, will be unveiled in about ten days. This self superlative develop more than 1000 hp and is expected to exceed 390 km/h in top speed. The presentation of the new hypercar from McLaren is close. In effect, the firm of Woking has announced that its Speedtail will be unveiled to the public on the Internet on 26 October to 14 hours. The 106 happy future owners may discover their new toy during a private event which will be held in London. The Speedtail will be the heir to the F1 released in 1993. This new model of the category Ultimate Series will stand out by its configuration to three seats, which they inherited from the legendary F1, the driver who is at the center of the cockpit. The Speedtail will benefit from a hybrid drive whose power will exceed the 1 000 ch. It will be the McLaren drive the most powerful ever produced (the P1 develops 916 hp and Senna 800 hp), but also promises to be the fastest. To the 400 km/h ? The british brand announced that the Speedtail exceed in top speed 391 km/h with the F1. 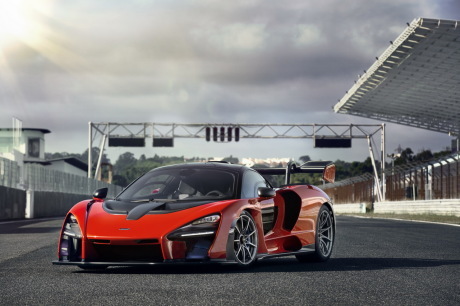 The P1 was limited to 350 km/h. Nothing has been released yet about the mechanism inside, but it seems probable that it is a new evolution of the V8 4.0 biturbo of 720S and Senna. The Speedtail will be a philosophy more typed GT that the radical Senna. The teaser was unveiled today allows us to guess the rear part of the car. McLaren speaks of a design ” futuristic and very sleek “ and it is true that the part that you can see does not remind of anything the existing models. In any case, the Speedtail should not use of aerodynamic appendages such as oversized, such as those available to the Senna. If all the details of this new model should be known on 26 October, its purchasers will, however, show patients to be able to drive it, since the production will begin at the end of the year 2019. Which leaves a bit of time to customize their car to their taste, thanks to the department MSO.